It was the Friday of the third week of September when I arrived in London, Ontario, after staying a couple of days in Toronto. It was 5:00 p.m. when I finally got there, and I happened to take an exit off the highway that ended up putting me on Horton Street. Honestly, I didn't really know where I was. I was driving by feel -- guessing. As I was coming to a stoplight, though, I had something of a vision pop into my head. For whatever reason, it was precisely at that point that I remembered an audio store had opened up in London in 2005 and I thought it just might be around here. Now, some will call what happened next fate, while others may consider it divine intervention, but I think it was just coincidence. Regardless, as I came to a stop at that light and turned the wipers on high, the windshield was just clear enough for me to look out toward the left-hand side and see, clear as day, that the store that I was thinking of at that exact moment was directly left of me. And while in my vision I couldnt recall the name, there it was emblazoned on a sign in front of the store: Sound and Space, Fine Audio and Theatre Solutions. Whether it was fate or coincidence or some kind of intervention, most would have just made the left-hand turn and went straight into the store. After all, it seemed the natural thing to do given all that. I just stayed at that light, even as it turned green. Luckily, no one was behind me. I just kept thinking, "Should I or shouldnt I? Should I or...?" You see, it wasnt clear that I should go in, for a few reasons. First, I wasnt planning on stopping there. Second, I was really itching to find Starbucks so I could buy a coffee -- Id be driving all day. Third, right after I saw the store and the name, I also remembered that the owner of the store, Tim Munro, e-mailed me when the store first opened about a year earlier asking me to drop by whenever I was in town. I never responded to that e-mail. Now I was unexpectedly out front. So, all those things were going through my head at once when, just as suddenly as that vision came and I turned to see the store, three words then popped into my head: "What the hell!" So I cut across the road and parked in the lot beside the store. Although it was still raining hard and I could barely make out what was in front of me, I eyed the exterior from inside my car. I was seeing a new, clean-cut, well-presented shop  nothing more special than that. I got out of the car and scurried to the front door, avoiding getting soaked. When I flipped open the front door, though, I was absolutely floored. As I said, the front of the store looked fine -- nothing more -- but the inside everything was drop-dead gorgeous. As a matter of fact, it might the most attractive audio store Ive ever been to, with stunning hardwood floors throughout; dramatic colors on the walls, including bright-red pillars, and attention to detail wherever the eye could see. I thought to myself, "I wish I could live here." I entered and within moments I found Tim, the owner, the guy I never e-mailed back. He was milling around in the back. I introduced myself as, "Doug, from SoundStage!, the publisher, the guy who never e-mailed you back." Tim smiled and chose not to embarrass me with any comments about my lack of online courtesy; instead, he welcomed me and began showing me around the store. Owner Tim Munro near the entrance to his store. Frankly, Munro must have blown a bundle getting this store all set up (he told me he has a background in architecture, though, so that more than likely helped quite a bit). The main room that first greets you has a couple lifestyle A/V setups, as well many of the store's smaller components strategically placed here and there. Behind that initial room, though, is the main listening room -- the big room -- and this is where the largest and priciest gear resides. I didnt get out a tape measure (nor did I have one), but the room is very big and can easily accommodate the largest speakers on the consumer market today. Furthermore, it was set up in such a way to accommodate smaller stuff too. 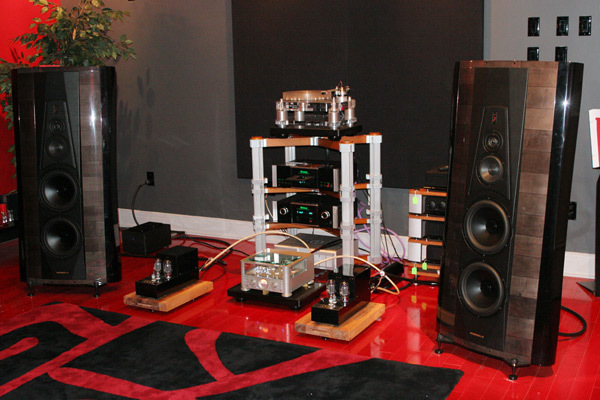 On the short wall, facing the length of the room, was a large system featuring Sonus Faber Stradivari Homage speakers. On the long wall was a much smaller system featuring Sonus Faber Guarneri Memento speakers. But this isnt just a Sonus Faber shop. I looked around the room and saw products from McIntosh, Thiel, Hansen Audio, Cary Audio, Monitor Audio, Totem, VAC, as well as numerous other companies. The Sonus Faber-based big rig in the main room. Tim next took me to the second level, a landing area where the stairs arrive to where yet another system is set up. There are also two more listening rooms up there. The larger of the two rooms is a custom-made home-theater room -- you know, with those special high-end theater chairs and all that stuff. A MartinLogan speaker system was set up there, but I didn't write down what all the electronics were. Thiel speakers were set up in the landing area, but, again, I cant remember the other brands associated with them. In the other smaller listening room, however, I recognized everything -- a complete Aurum Acoustics Integris system, replete with all the accessories, exactly like the one Id just reviewed with Marc Mickelson in September here on SoundStage! The only non-Aurum items in there were the Totem "beaks" atop the speakers. Tim contends that they improve the sound. "I sold an entire system to a person in town," Tim told me. I wasnt surprised, actually, since the performance of this innovative all-Canadian setup represents the state of the art in terms of sound quality. Its not cheap, mind you; the whole thing will set you back about 50 grand if you want the whole she-bang, which includes all the accessories like the stand and the anchors for the speakers. But youd have a tough time finding better sound given that this stuff is all designed to work together perfectly. And based on the experience I had with it, it does. Tim went on to explain how that person came in looking for the best, and he was introduced to that complete system. He saw it, listened to it, probably mulled things over for a time, and then figured that it was ideal given the fact that he was shopping for something complete, not picking and choosing. He has a system many would consider to be the best sound attainable today. I would. 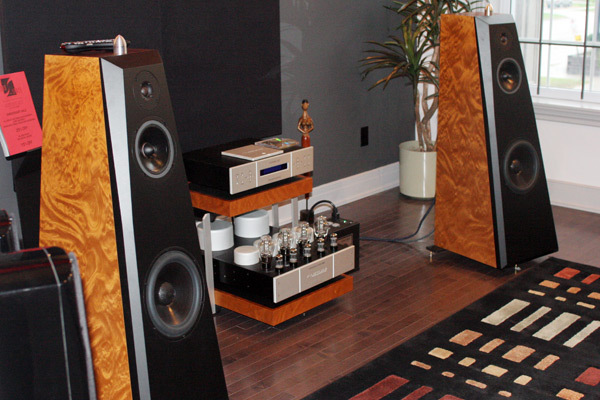 The Aurum Acoustics Integris system complete with Totem "beaks." But Sound and Space is not just about one system like that from Aurum Acoustics, or one brand, like Sonus Faber. Tim had so many brands in the store when I visited, more than I mentioned in this article, that I asked him "Why?" Normally stores settle on a limited range of brands, preferring to focus on those and steer customers toward them. For Tim and company, though, its more about establishing exactly what it is they want to carry. Tim's store is relatively new, opening in October 2005, and, obviously, he's learning what his customers want. In fact, his customers appear to be an integral part of the store. When I arrived, a Friday-night wine-and-cheese shindig was going on. I learned that Tim's customers arent afraid to speak up. As a matter of fact, I thought that one gentleman talking with me was one of Tims salesmen. He knew this, that, and the other thing on just about every high-end piece that was in the store, or had been in the store. He was telling me the good, bad, and ugly about it all, summed up in ten words or less. I was actually surprised at his knowledge and candidness, and I only found out after about an hour that it was one of Tims customers. Was he fanatical? Not really. I used to be like that way back when. I hung out in audio stores for hours on end, talking with the staff, trying out the gear, and basically calling it my second home. That was in 1982, the year I graduated from high school and used to pester the salesmen at a place called Custom Stereo. Honestly, I thought that such behavior had pretty much gone with the Internet, and that we'd never see stores like that again. On the Friday of the the third week of September, I learned that I was wrong. Thats exactly what Sound and Space is like -- a store from another time, but set in the present. And from what I could tell during my brief visit, Tim Munro and Sound and Space are trying to make a name for themselves the old-fashioned way: with a great-looking store, well-set-up sound rooms, lots of equipment to choose from, and knowledgeable staff willing to listen to equipment in order to find out whats the best. Oh, yeah, and they have customers who hang out all day. And to think that I was actually going to drive right by. 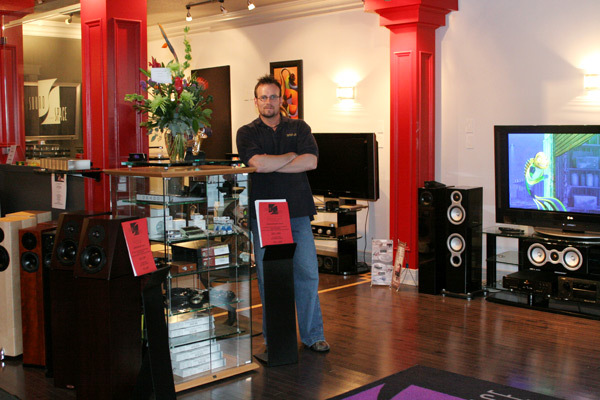 Sound and Space is located at 339 Horton Street in London, Ontario, Canada. You can visit the store's website at SoundAndSpace.com.